It’s hard to come home after work and continue to work. While a regular working day is 8 hours, it’s not uncommon to find employees working 10-12 hour days. So up to 12 hours of your day can be spent at the day job. Let’s say you get 8 hours of sleep (which is a luxury for some) 12 hours for the day job (that includes commute) you’ll still have up 4 hours for yourself. Factor in chores or cooking time, maybe 2 hours left per day? To maybe work on something you love? While the numbers aren’t completely accurate and of course your day to day will differ according to circumstance, it’s still up to you to take control of your time. We’ll look into how you actually have more time than you think. We often say “I don’t have time” to things we simply don’t want to do. 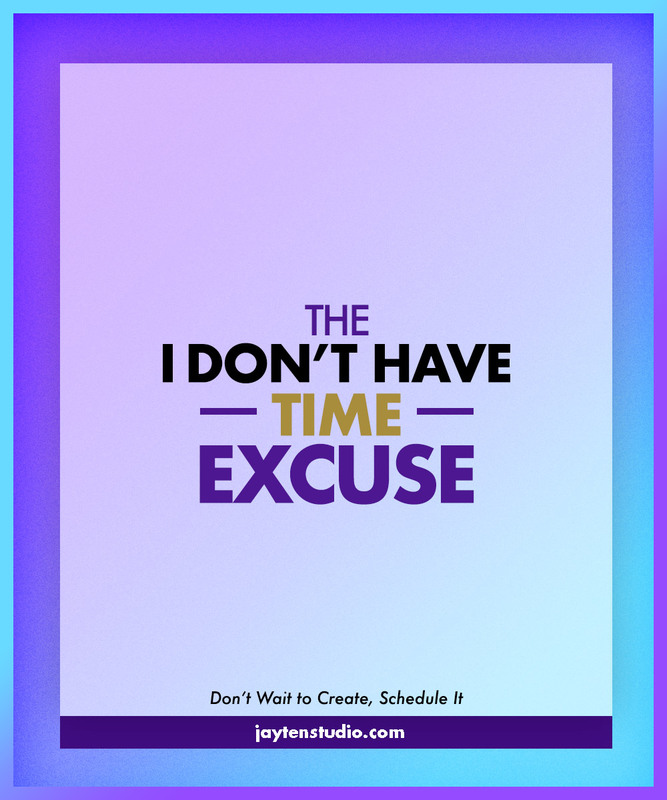 Saying you don’t have time is an excuse. Do you really care if you’re always shifting your passions to the side? Your friend gets injured and needs to be taken to the hospital. You wouldn’t say, “hold on, I just need to see if I have time…” No—you should be off to A&E. You have no “time” because you don’t have clarity. You’ll save a lot of energy if you plan ahead. Whatever your method of planning is, you’ll be prepared and know exactly what to work on after you finish day job. Okay, from now on your time after work is going to be all about working on your creativity. Schedule it in. By mid-day you should be getting pumped to go work on your side projects because it’s something you have scheduled. It’s a must. I mentioned at the beginning of this series, the day job is your engine to work on your passions and creative projects. Even if that time is just once a week, you will look forward to it because it’s something you just have to do. That "time" you set aside should be non-negotiable. You’re setting yourself up for failure if you believe your creative projects will take off right away. I hope I’ve been careful while writing about this topic that my view isn’t a sure way to success. I’m writing at the very least, to bring some realisation that building a business on the side is possible. For me it’s when I’m eating dinner, commuting to work, brushing my teeth. I’m using this time to set a clear list of intentions, plan for my day ahead and generate ideas. For other’s it’s in the shower or going for walks. Generally, any sort of down-time can be used. There will be pockets of time throughout your day—find them and fill them productively. Next time you find yourself saying “I don’t have time for…” think about the relevancy and the importance of what you’re saying no to. If the answer is close to “because I’m lazy” you’re making excuses. If you’re not turned off yet by the idea mindset is everything, I haven’t spoke about it enough. Revisit the previous post on 5 mindsets you need because I believe it’s so important to have the right kind of thoughts to energise you for your creative projects. Still having trouble setting time aside? Hey, maybe I can suggest something that I’ve not covered in this article. Tweet me! But on that note, there’s one more article left to tie this series together, so stay tuned. Many many thanks for reading!